A few years ago, it was hard to find “clean” skincare products. Because of this, I had to learn how to make most of my products. By “clean,” I’m referring to products made with non-toxic or natural ingredients, which are made by companies that are transparent about these ingredients. It’s encouraging to see the shift in the products available today. 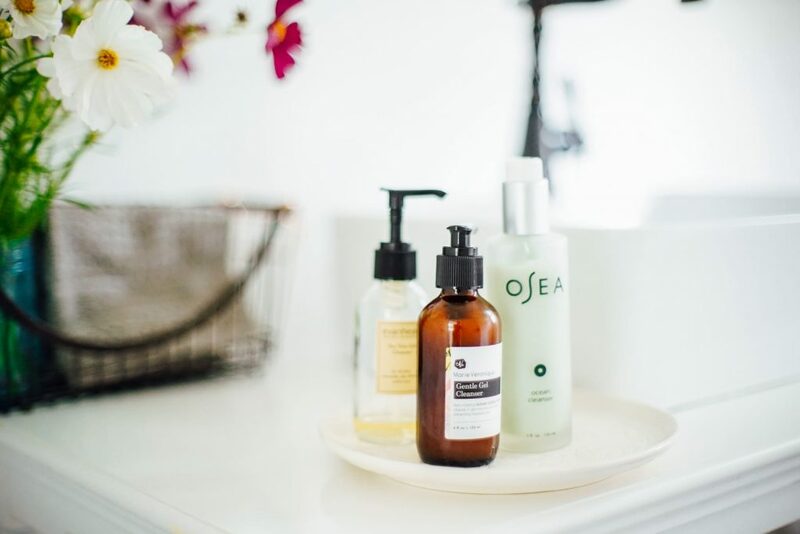 With the expansion of the internet and online bloggers and shops, it’s easier than ever to find “clean” skincare products. If you don’t want to make your own products, you can now find super effective skincare products from brands that are transparent and proud of their standards, ingredients, sourcing. The goal of this Make the Switch Series to help you do exactly as the posts are titled: make the switch. Over the years, I’ve been able to experiment with both homemade and store-bought products. Over the past couple of years, I’ve dabbled even more with store-bought options. Even with all this dabbling, I’m still learning about new products and new (to me) companies. These posts are a way for me to share a few of my favorite options in various categories. Baby steps. I’ve been on this journey for 10 years. It’s taken me 10 years to get to where I am today, and even now I’m still learning and growing and making changes. Small, intentional steps are the key to a long-term lifestyle. The goal is never some kind of perfection; rather, the goal is intentional living and progress. Start with the products you use regularly. Here’s the thing. 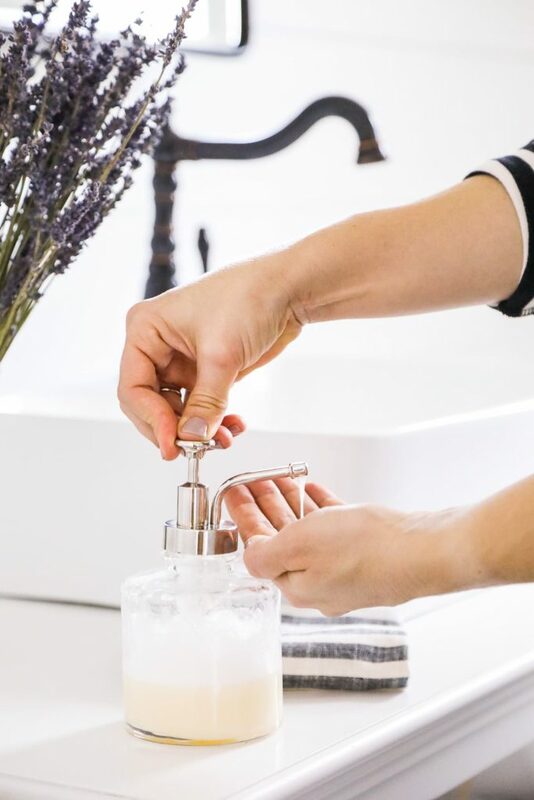 You may want to switch over your entire bathroom cabinet right now, but doing so would cost a fortune and won’t give you time to find the products YOU love. I recommend slowly making changes, starting with one product at a time. Which product should you choose first? Start with the one you use most frequently and the one that comes in direct contact with your skin. Maybe this is lotion or foundation? Maybe this is your moisturizer? Maybe this is deodorant? Maybe this is toothpaste? I’m going to be touching on all these products over the next few months. Today, we’re going to talk about face cleansers (face wash). A face cleanser shouldn’t be harsh or strip your skin of its own natural (beneficial) oils. This stripping causes an imbalance of the skin-this can cause breakouts and other issues. Instead, it should clean your face, gently, by removing dirt and makeup (if you’re wearing makeup). The cleansers listed below are gentle, range in price points, and are made with ingredients I feel good about applying to my skin on a daily basis. When looking for a non-toxic face cleanser (or any skincare product), choose a product made by a company that’s transparent about ingredients. A company should be proud of the ingredients used and should clearly state these ingredients on packaging and their website. A company shouldn’t hide behind big mysterious words like fragrance. Instead, a company should be willing to share exactly what’s in a product and how it’s made. 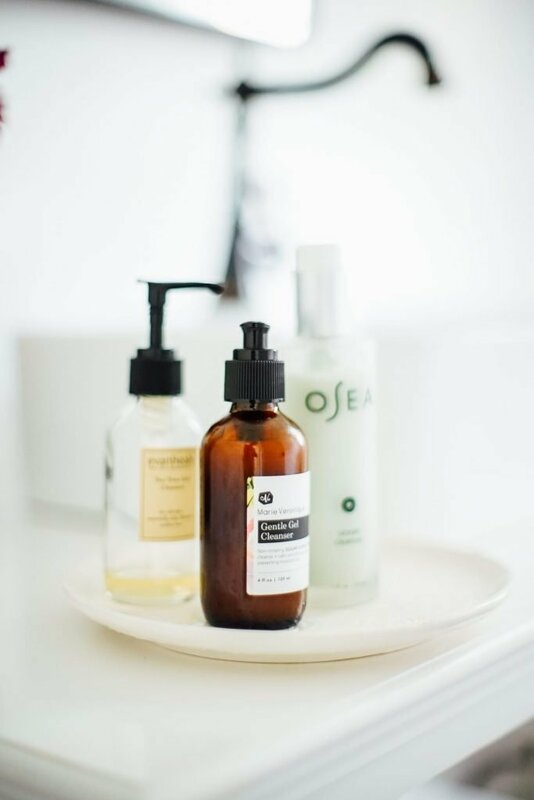 If you’re unsure about an ingredient (just because an ingredient is hard to pronounce doesn’t mean it’s unsafe–when it comes to skincare and cleaning products), use the Skin Deep Database from the EWG to look up the specific product or ingredient in question. This database provides information about the safety of ingredients and overall rating for products. 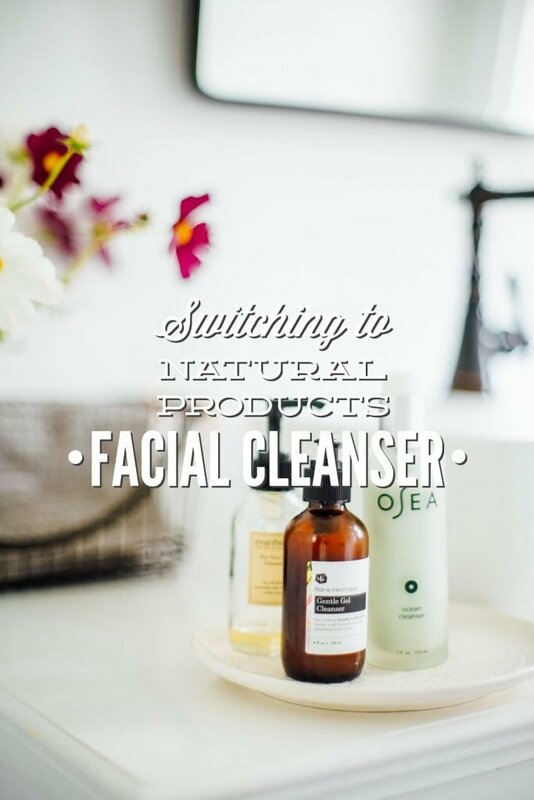 A great way to browse the non-toxic face cleansers out there is to visit a site like The Detox Market. 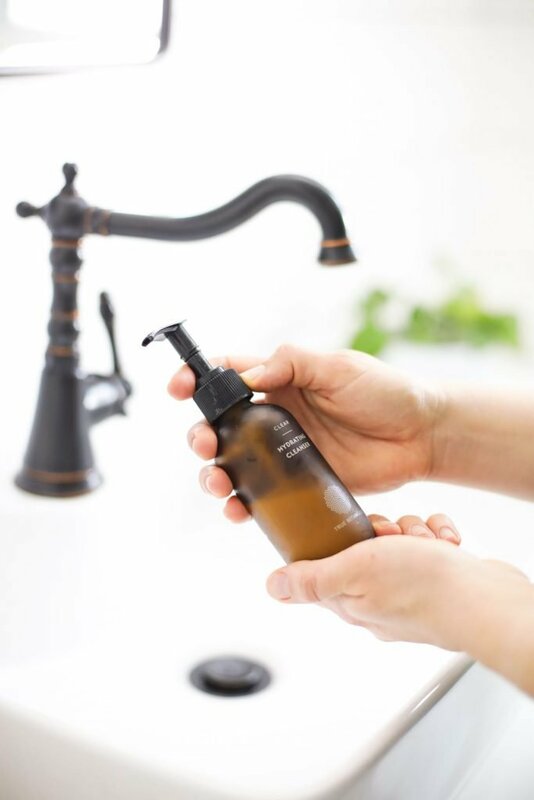 A place like the The Detox Market curates non-toxic products via their online shop, which makes it easy to see what’s out there. Most cleansers will come with instructions so read the bottle and brand’s product page (on their website) to get the most of your cleanser of choice. I only use a facial cleanser at night. In the morning, I simply wash my face with water in the shower. There’s no need to use a cleanser on your face in the morning. Considering this, most of the store-bought cleansers listed last a few months. If you’re going with a homemade, water-based cleanser, you’ll want to use it quickly since no preservative is added–about a month. I’ve learned the secret to using any face cleanser is to first massage the product on a damp face and then use a soft, wet washcloth to rinse off the cleanser and any dirt/makeup (rinse a couple of times, if needed). The cleanser will loosen dirt and cleanse the face, but it’s important to use a cloth to aid in the process. I use gray washcloths since they don’t show makeup or dirt. If you want to see my personal skincare routine in action (including how I wash my face with a cleanser), watch this video. I’m going to start with my favorite cleanser. It’s gentle and great for sensitive skin (or any skin type), removes makeup, and leaves my skin feeling clean and super hydrated. One bottle lasts a long time (for me, about 4 months) and the packaging is glass. You’ll only find OSEA products online, unless you have a green beauty store in your area. OSEA is also available from Amazon and The Detox Market. Now, let’s talk about my second favorite facial cleanser, Marie Veronique Gentle Gel Cleanser. Marie Veronique makes several facial cleansers, but this one is my favorite. Just like OSEA, this cleanser is super hydrating, gentle, and removes makeup. This cleanser is a few dollars cheaper than OSEA and one bottle does last a while. The best place to purchase Marie Veronique products is online, via the company’s website or The Detox Market (although they only sell a few of the products). True Botanicals is a company that delivers amazing results. In fact, True Botanicals beat out Proactiv for clearing acne. This company is cutting edge, makes products that are incredibly effective (including shampoo and conditioner), and the products are “made safe” certified. I personally don’t use the cleanser from True Botanicals because I’m in love with OSEA cleanser, but I have used it in the past. That said, I do use True Botanicals in my skincare routine (as you saw in the video). The Pure Radiance Oil is liquid gold and my go-to moisturizer in the morning and evening. It’s transformed my skin. The best place to purchase True Botanicals products is online, via the company’s website. A piece of money-saving advice… If you sign up for the sun and moon subscription (which is free) you save on regular purchases and get a free gift (they’re legit gifts). That’s how I get the radiance oil and shampoo and conditioner, which I have on a 4-month restock schedule. Leahlani is another one of my favorite skincare lines. Leah’s products are hand-crafted in Hawaii. For face cleansing, the popular Pamplemousse Enzyme Oil is a lovely way to gently cleanse the face and remove makeup and dirt. This is an oil-based cleanser, so it’s a bit different than the other products recommended on this list. For exfoliation and extra cleansing, you can follow the oil cleanser with the Honey Love cleanser and exfoliator. The best place to purchase Leahlani Skincare is online, via the company’s website. I found this brand at Whole Foods last year and instantly fell in love. The ingredients are botanically based and the packaging is beautiful (and glass). I’ve tried both the Tea Tree Cleanser and Milk Cleanser with good success. I will say, the cleanser goes fast. A bottle hasn’t ever lasted me as long as the OSEA or Marie Veronique cleansers. 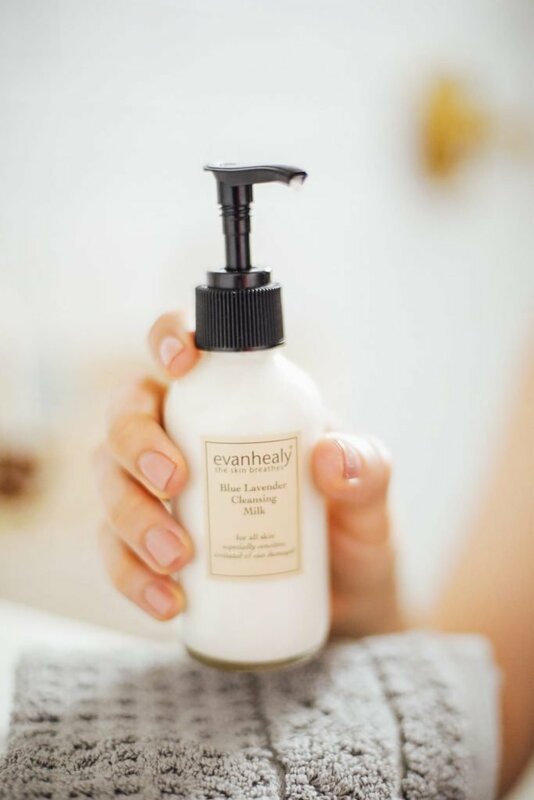 Evan Healy products can be found at health food stores, Amazon, and Whole Foods (catch the occasional sale for the best price). This cleanser is another affordable option ($25) that can be used on the body and face and will also remove makeup. It comes in a plastic bottle, unlike many of the options above which come in glass (I know this is important for some folks). It’s suitable for all skin types, including dry skin since it won’t dry out or strip your skin. One Love Organics can be found online, via stores like The Detox Market or via the One Love Organics website. Acure Organics is a great budget-friendly brand. I’ve tried the cleansing gel in the past and enjoyed it. They also make a cream cleanser. Acure can be found at Target, Whole Foods, Amazon, and some health food stores. Let’s transition to a few homemade or do-it-yourself cleansers. The options listed below are budget-friendly and super easy to make. This cleanser uses the antibacterial and humectant power of honey to cleanse and hydrate the skin. I recommend using a makeup remover before this cleanser. If you’re looking for an exfoliant/cleanser/mask all in one, this is cleanser is for you. To make a facial cleanser, combine the cleansing grains (a powder made from ground oats) with a liquid and then massage the grains on the skin. I recommend using a makeup remover before using the grains. If you’re looking for more of a soapy cleanser, this is a great option. This easy-to-customize recipe starts with a castile soap base and then builds from there, based on your preferences. Castile soap can cause the skin to feel dry and tight, so if you have dry skin or you’re looking for extra hydration, this cleanser may not be your best option. If you love a particular face cleanser/face wash, share your experience in the comments. I love learning about new brands and products from you all. Hi Kristin, thanks for the tips! What is your opinion of Dr. Hauschka skin care products or Weleda? Hey Elise, Both brands vary with products, so I definitely recommend looking at specific products on the Skin Deep site from EWG (https://www.ewg.org/skindeep/). I haven’t personally tried either brand, but from a EWG search, it looks like most of Weleda’s products check out “clean” as far as ingredients. 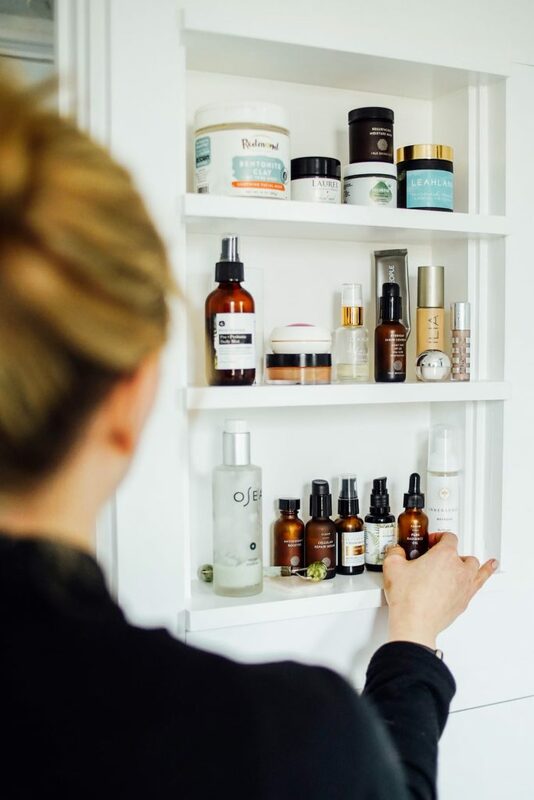 The Dr. Hauschka’s products are a bit more iffy–but this all depends on what ingredients you’re cool with having in your skincare products and what ingredients you’d like to avoid. This varies from person to person. Fragrance would be the one I’d like to know more about from the brand–what’s used to make their fragrance? Hey Elise, I look into Weleda and everything looks fantastic from what I can see–ingredients and formulas. OK, thanks! I have used and like Dr. Hauschka’s cleansing milk, but I don’t see it listed on the EWG site. I’m having trouble finding a similar cleanser I like, that’s clean and not too expensive. Hi Kristin. I agree that natural products are really safe for our skin especially sensitive skin like me. I’m a sensitive skin so it’s difficult to find products which matched to my skin. Thanks for sharing. This will be great to be my guide to take care of my skin. Sharing my experience, I use organic face wash. I found a positive result. From this post, I’m interested in Leahlani Skincare. I think I’ll try it.